A tribute to a machine that's truly universal! Welcome to the Universal Boring Machine Page! My home shop started small, with a ten inch Logan Lathe. Later it was joined by a Brown and Sharpe 1 1/2 Universal Miller, a LeBlonde Cutter Grinder, a J-head Bridgeport, and a 26 inch Crescent bandsaw. But the machine I have always most admired has been the Universal Boring Mill! My interest in these machines began during a field trip during my high school days to a local machine shop. The tour leader stopped by a large horizontal boring mill and mentioned "this machine is so versatile it could reproduce itself". 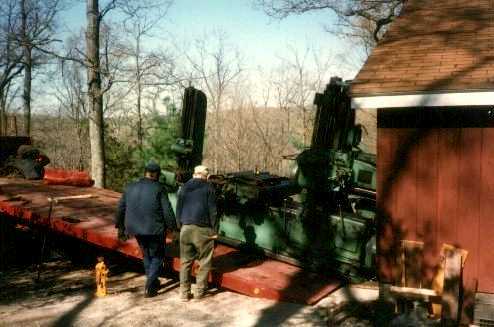 Later, a small shop where I worked had a 3 inch Universal Boring Mill similar to the one in the above picture. The operator of this machine was a man of long experience and highly praised the "Universal" versus other lesser machines. Later I worked in shops with other horizontal boring mills which I always compared to the "Universal", but none of them ever quite measured up. Meanwhile, here in the northeast, it seemed every week brought news of another fine old company going out of business. The machinery dealers all had more stuff than they could store. There were so many auctions that most people had lost interest in going. One day in December 1986 I attended the sale of a plant that had made wire forming machinery. There were two Universal Boring Mills there, one, rather old and tired, in the milling department, and another, much newer, in very nice condition. It appeared to have been used primarily for boring with long boring bars and was complete with the outboard support. I had mentioned before the sale began to the manager about how much I liked Universal Boring Mills and hoped to own one myself someday, if I had a place to put it and could justify it economically. I left before the sale ended without spending any money. Later that week the manager called me and lamented that no one had bid on the second Universal. "Sure you wouldn't be interested if the price was really right" he asked? Well, I told him I would think about it and went home to take a few measurements. I decided that by removing the garage door and some siding and cutting a notch in the header I could squeeze it in. It's weight of 18,400 pounds was way beyond anything I had moved before, but I talked to a rigger who could pick it up with a big tilt bed truck. So I called back the sale manager and for a few cents a pound became the proud owner of my own Universal Boring Mill! Click here for a big, detailed, JPEG image! This is a picture from the factory of the machine one size smaller than mine. The 3 inch bar machines came in three models, with either 60, 72, or 96 inch beds, and table widths of 26, 32, or 40 inches. The models were called the "Beauty", the "Brigand", and the "Burtel" in order of increasing length. They were also made with 4 and 5 inch bars. I have seen one that was equipped with a threading attachment, making it even more "universal". 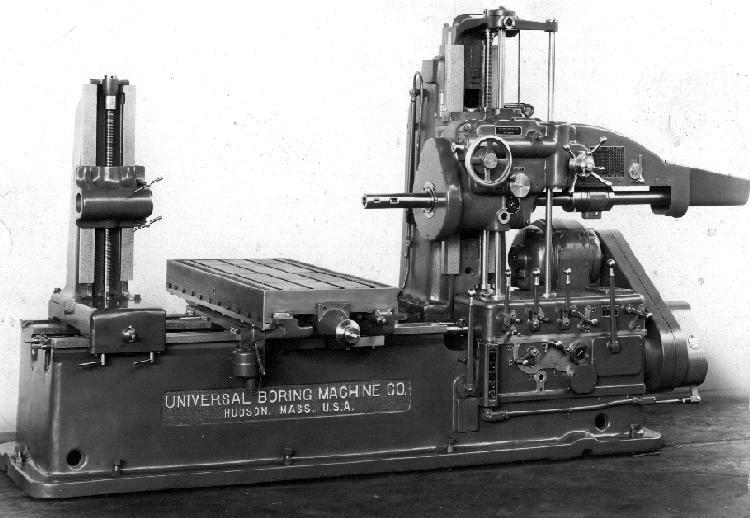 I am still trying to find out more about the history of the Universal Boring Machine Co. I know they built these machines from about 1920 until 1949 in Hudson, Massachusetts, at which time the product line was purchased by the Bullard Company and production was moved to Bridgeport, Connecticut. Machines built in Bridgeport carried "Bullard" nameplates. If you can help with early history, please send me a message at the address below. An interesting job on the UBM. Boring new seats for precombustion chambers on a Waukesha Diesel cylinder head. Please include "UBM Page" in the subject line so your message is not swept away by mistake.